Issues & Trends in Course & Program Articulation in Oklahoma Dr. Erin Taylor, Coordinator for Academic Affairs Projects Dr. Debbie Blanke, Associate Vice. 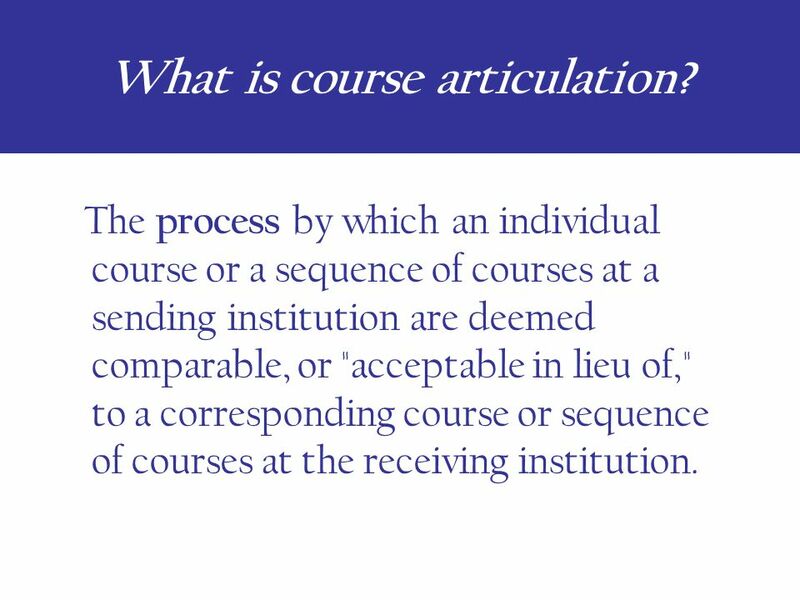 2 What is course articulation? 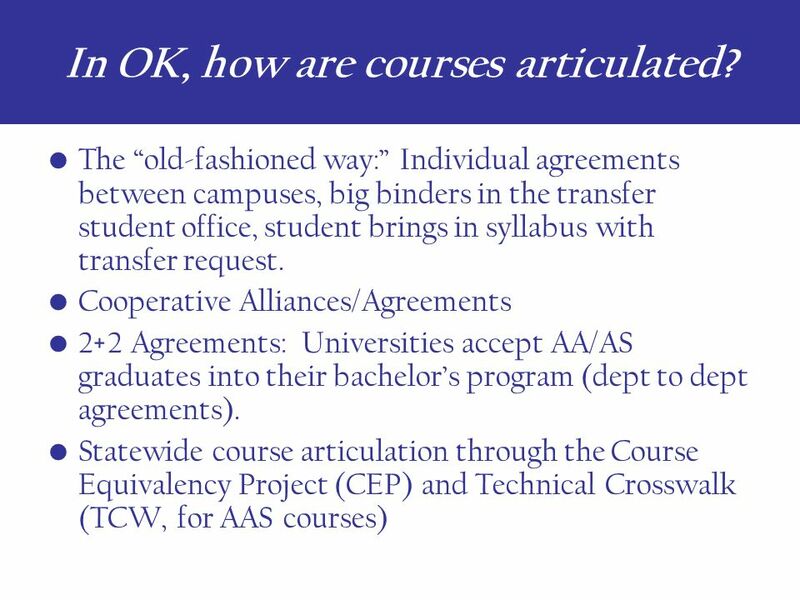 The process by which an individual course or a sequence of courses at a sending institution are deemed comparable, or "acceptable in lieu of," to a corresponding course or sequence of courses at the receiving institution. 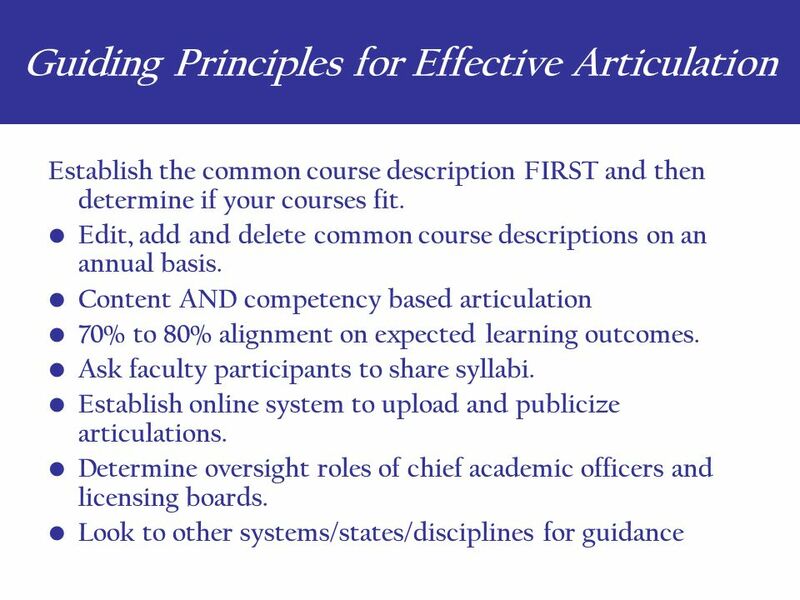 3 Course A is equivalent to Course B if and only if Course A satisfies at least 75% of the program requirements that Course B satisfies – serving the same purpose with respect to content delivery, general education, program/ degree requirements and learning outcomes. Courses within a single equivalency group (e.g., Microbiology) are guaranteed to transfer among institutions that sponsor courses in that group. 8,000+ courses currently on CEP What is course equivalency? 6 Nutrition 001 –Introduction to the science of nutrition. Overview of the principles of human nutrition including role of nutrients in human processes. Students will connect health outcomes to eating habits and nutrition policies. 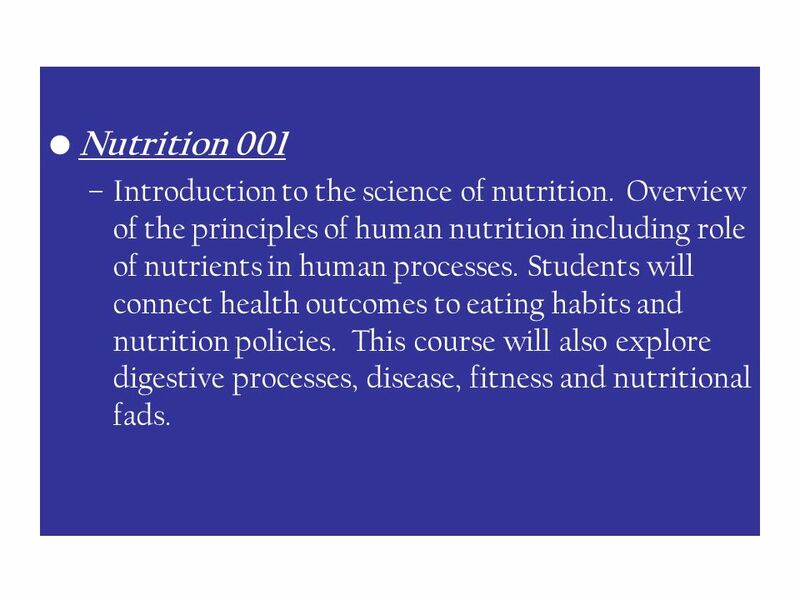 This course will also explore digestive processes, disease, fitness and nutritional fads. 8 CEP Process Faculty in selected disciplines meet annually at UCO for afternoon meeting. Review common course descriptions and add, modify and delete courses. OSRHE uploads articulations that take place at this meeting. Chief academic officer is given two periods to review all of the course modifications made by faculty from their campus Final uploads are made and the CEP is approved by the Council on Instruction followed by the State Regents. Nursing faculty are welcome to participate in this process. 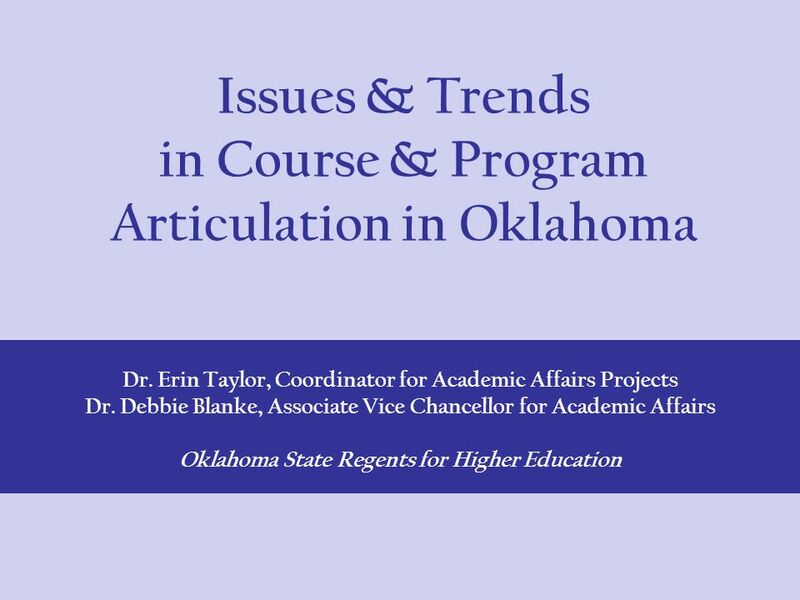 Download ppt "Issues & Trends in Course & Program Articulation in Oklahoma Dr. Erin Taylor, Coordinator for Academic Affairs Projects Dr. Debbie Blanke, Associate Vice." Dual Credit in the Illinois Community College System. Life Impact The University of Adelaide Discipline of Pharmacology, School of Medical Sciences Faculty of Health Sciences Development and Integration of. Leadership Institute for Continuing Education Administrators NCCCAEA March 28, 2013. 1 Oklahoma’s Completion Agenda. In The Global Economy of the 21 st Century, 90 Percent of the Fastest-Growing Jobs Will Require a Higher Education. ARTICULATION 101 August 31, 2010 Ruth Cranley, MJC Articulation Officer Based On: California Articulation Policies and Procedures Handbook, Spring 2006. OKLAHOMA STATE REGENTS OF HIGHER EDUCATION Presented by Houston D. Davis, OSRHE February 2008. Articulating CTE Courses A New Approach Linda Corr-Mahugh Articulation Specialist Business/Marketing Pathway Specialist Montana OCHE/OPI October 2009. University Council Shared Leadership for Integrated Planning and Consultative Decision-Making. Training for Implementation of CEC§ Creating AA-T and AS-T (SB 1440 Transfer Degrees) Spring 2011 February 1, 2011. October 10-12, 2004 Boise, Idaho Welcome Transforming Learning Opportunities through Enrollment Partnerships.